I received my Myst book today, and it’s gorgeous! Totally feels like a real linking book. It’s huge – given that I didn’t order the inkwell, I’d have preferred it a little smaller instead of all that empty space. But I’m not complaining, obviously designing two versions would have raised the cost and development time. The exterior has already been described extensively by the most qualified reviewer imaginable, and I have nothing to add to that, but I haven’t seen any reports about the inside so far. So let’s get to that! 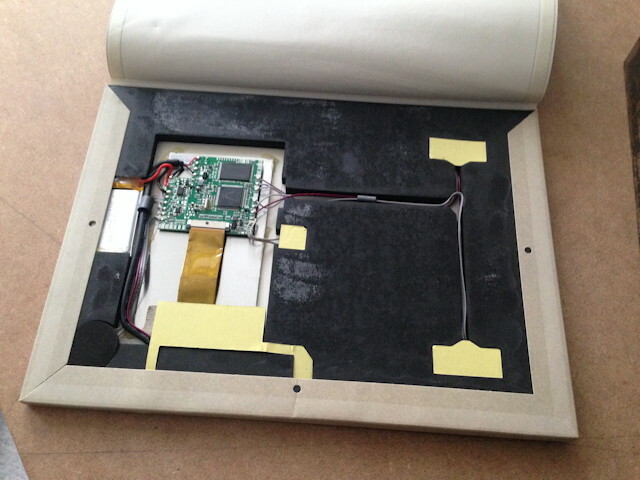 The electronics are enclosed in a separate cardboard assembly that is inserted into the main frame and fixed with some adhesive. 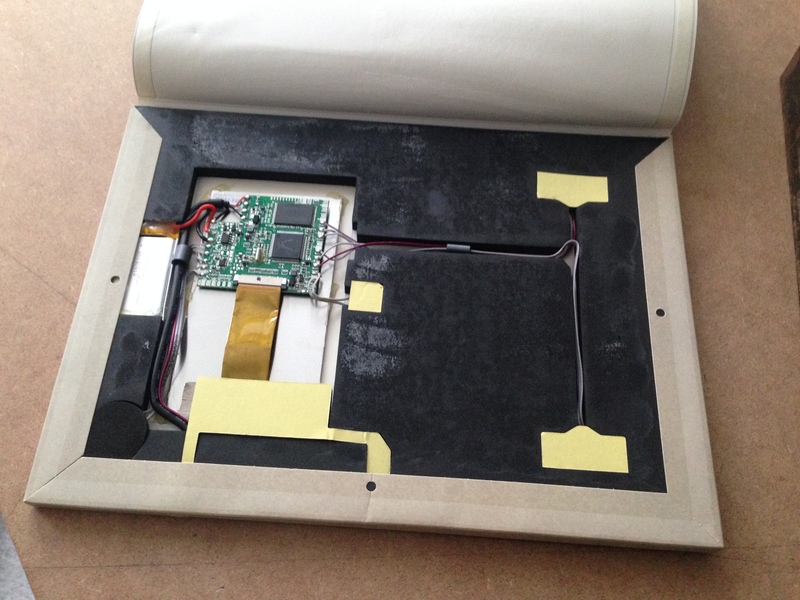 Luckily it hadn’t caught on very well yet, so I was able to lift the assembly by the USB port and carefully pry it out of the book without undue damage. 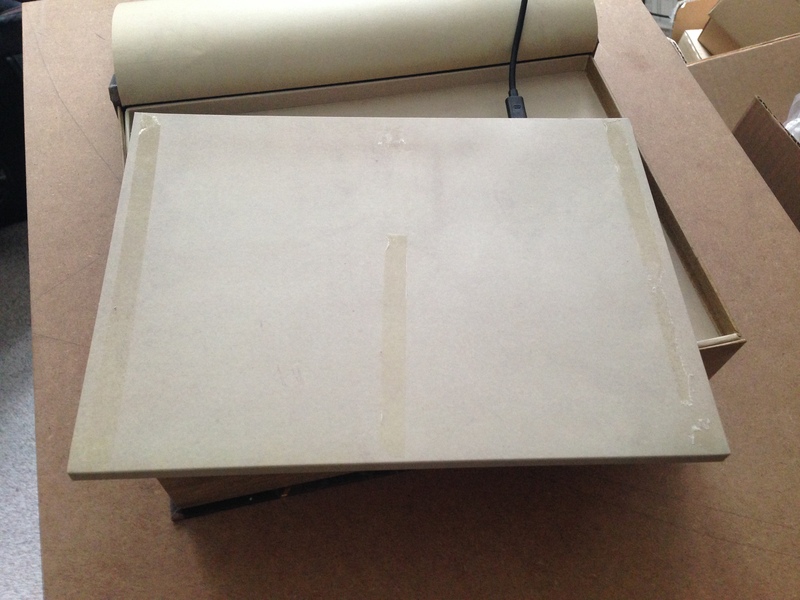 There are three strips of very sticky adhesive on its bottom that I had trouble removing at first, until I found that I could carefully peel them off without damaging the paper when heating them with a hairdryer. Small residues could be removed with a soft pencil eraser. The adhesive is not really needed, the assembly fits tightly enough that it stays where it should just fine. Opening it up was a little harder, because the bottom flap is glued on by virtually its entire surface. There are three of the same adhesive strips along the edges, and the surface of the black foam frame beneath is sticky as well. By applying more heat from the hairdryer and carefully prying up with a knife, I was finally able to peel it off, undamaged except for some bending (which is not a big deal because this part is hidden inside the book when assembled). ATJ229R2 by Actions Semiconductor. This appears to be a MIPS SoC with a bunch of hardware multimedia decoders and might be running Linux. The next steps toward figuring out whether we can run anything more interesting than videos on this thing would be figuring out whether there is a serial console or a USB host or anything else of interest among the unsoldered pads on the PCB, but that will have to wait until later. How could I spend all that money and then not take it to bits? That’s the most interesting part!